Which DPS meter should I use? How do I upload my logs to Moongourd? How do I know if my meter is uploading logs to Moongourd? What is the complete list of upload restrictions? Help! My log wasn't uploaded to the site! My log wasn't uploaded after the boss died, is there any way for me to upload it manually? My log is gone or was deleted, can I get it back? 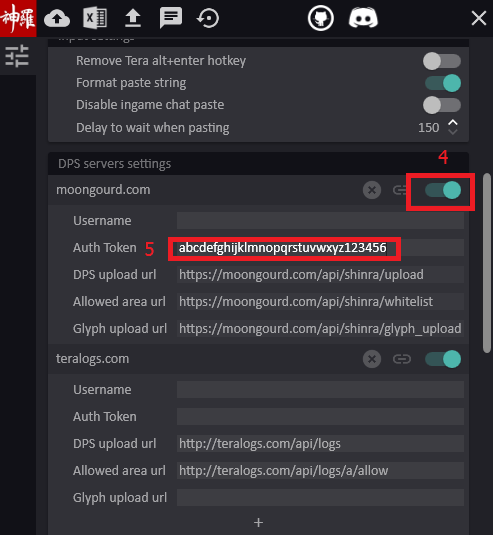 Do the logs uploaded to Moongourd expire? What dungeons are supported on Moongourd? What do all the colors and symbols on Moongourd mean? Moongourd Character Registration/How do I use the Recent Activity page? Why isn't my run showing in Class/Party Rankings? How do I support Moongourd? I just donated, how long do I have to wait for my perks? How do I change the color of my class icon? I have donator status, but ads still show. How does guild updating work? How does character hiding work? Moongourd supports 2 meters: Shinra Meter and CasualMeter. Both will work, but keep in mind that CasualMeter does not support Moongourd's character verification system. Try to keep your meter up-to-date. See the FAQ section for registering characters. Your auth token is available in your Account Settings. 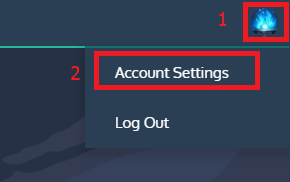 Go to your Account Settings and copy your Auth Token. Check the Site export box and paste in your token. MAKE SURE TO ALSO REGISTER AT LEAST ONE CHARACTER ON THE SITE. IF YOU DO NOT REGISTER A CHARACTER, UPLOADING WILL NOT WORK (CLICK HERE). The Upload Activity page displays the last 100 logs that were sent to Moongourd for upload. If your log doesn't appear here, then it never reached our server. Your party's damage must exceed the boss' HP, up to a maximum of 110%. That is, if you fight a boss with 1,000,000,000 HP, then your total party damage must be between 1,000,000,000 and 1,100,000,000 inclusive. Your party DPS must be above 2m/s. Parties with more members than what the dungeon supports cannot be logged (e.g. 6 people in a 5-man dungeon). Apparently this happens when a GM visits you in a dungeon. All logs are uploaded so long as they meet the above requirements. Note #1: Slaying is detected by meters as staying below 50% HP for more than 40% of a fight. 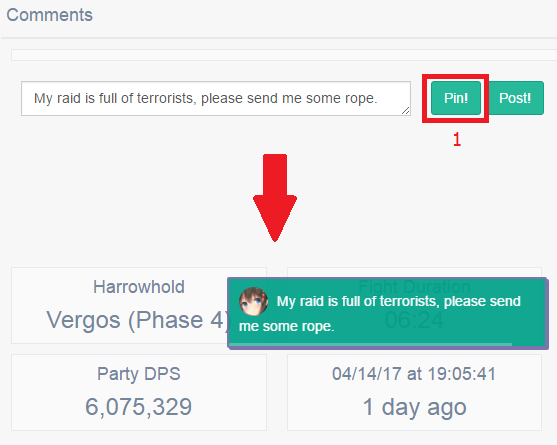 Note #2: The party DPS tolerance for raid uploads is ±130% instead of 110%. Note #3: Multitank runs outside of raid instances do not qualify for party and class rankings. Note #4: Uploads will not appear in Party Rankings if you already have a higher DPS run with the same party. Check the Upload Activity page; it will provide a reason why your log wasn't accepted. If it isn't there, then it's an issue with your meter. 1) There was something wrong with it (e.g. it wasn't uploaded properly). 2) It was collateral damage from a group delete. 3) There was a server error. Although Moongourd creates backups for all logs, it will not be restored under normal circumstances. Short answer: probably not. Long answer: it depends if the server is running low on space, otherwise, logs don't expire. All bosses listed under Supported Bosses and Areas are supported. To see the list navigate to General > Uploads. Note that a red border (Slaying) overrides a brown border (EU Consumable), i.e. only a red border will show if a player is using both a Slaying Crystal and Combat Accelerator Potion, or other EU consumable. To register your character to Moongourd, you need to verify your TERA characters by uploading a glyph build to the site (Shinra 1.46+ only). This allows us to confirm confirm that your ownership. Registering characters also adds your characters to the Account Clear Rankings, gives you access to Recent Activity, and allows you to change the color of your class icons if you're a donator. To add a character to your Moongourd account, open Shinra Meter's action menu and click "Upload glyph build to moongourd.com." Then go to your Moongourd account settings. Under "Add Characters," select the character you want to link to your account. See below for details. Class and Party Rankings update every hour, starting at 00:00:00 PST. The best way is to donate via PayPal. Donations pay for nearly all of Moongourd's operational costs. If you've seen this message, it means you're using an adblocker that's not doing its job. The pop-up is incredibly annoying, so we recommend getting a better adblocker, donating to disable ads site-wide, or turning off your adblocker and deal with the ads. No one likes ads, but the reality is that they bring in a small, but stable stream of income for the site to continue growing. Sorry, that's just the way it is, but we hope you understand. At the very least, Moongourd will only display a maximum of 2 ads per page: one at the very top, and one at the very bottom of the page. 6) The maximum amount of characters you can register on the site increases from 12 to 20. 8) Comments on uploads can be pinned. No, this is a one-time donation and all donation perks are permanent! All donations are automatically processed. If you don't receive donator status within 5 minutes, try relogging into your account. If that doesn't work, please contact teri#9999 on Discord, or send an email to admin@moongourd.com. Please add your characters to Moongourd. See this guide for details. Once you have added your characters to Moongourd, go to your Account Settings, select a color, and click Update Icon. There are no restrictions for colored icons. You can choose any color you want, but keep in mind that selecting white will cause your class icon to appear invisible. After you receive donator status, ads disappear after your next session. Try relogging into your account. 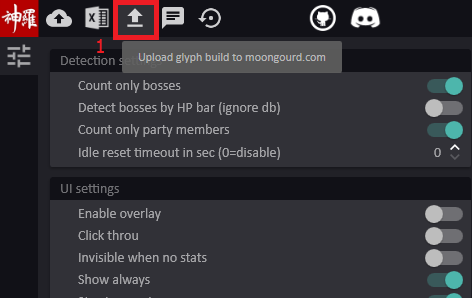 If you change guilds and would like previously uploaded logs on Moongourd to reflect that, you can choose to update it in your account settings. Select the character you would like to update and click Update Guild. This will take the guild name from your character's most recent upload (must be within the last 7 days, and an upload using Shinra Meter 1.81+ or the latest version of CasualMeter) and apply it to all logs stored on Moongourd. To prevent abuse, you may only update guilds every 12 hours. This cooldown is shared with character hiding, so beware. Once you have added your characters to Moongourd, go to any of your personal encounters. Scroll down to the bottom of the page, click on the button to hide your characters, and confirm. All characters you have registered on Moongourd will be erased from the log, and placeholder names will take their spots. Please note that hiding your character from an encounter is permanent and cannot be undone. Please also note that after you hide a character from an encounter, you may not do so again for 12 hours. This cooldown is shared with guild updating, so beware. Donators can pin messages on any log on the site. After typing your comment on an encounter, click Pin! (instead of Post!). The pinned message will be visible by all users on the site. Note that an encounter will only show the 3 most recent pinned messages. Please use common sense and refrain from spamming.